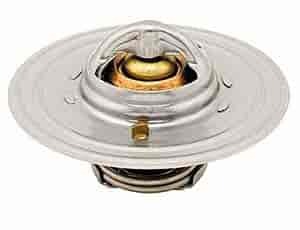 High-performance thermostats are designed to resist large variations in coolant pressure that occur at high RPM where coolant temperature and coolant pressure fight for control of the thermostat to keep it from opening at its designated temperature. These balanced thermostats open at the right temperature regardless of engine RPM. Does Mr Gasket 4366 fit your vehicle? 4366 is rated 4.0 out of 5 by 1. Rated 4 out of 5 by jet73 from Good buy for the money The hi flow thermostat works as advertised. Before installing, I put thermostat in hot water to very it worked properly.